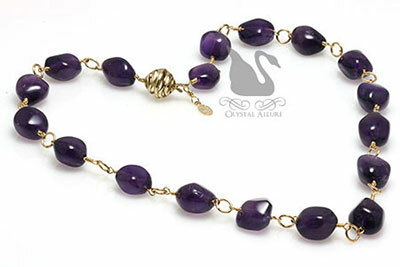 When I discovered these stunning amethyst gemstone nuggets -and in purple! 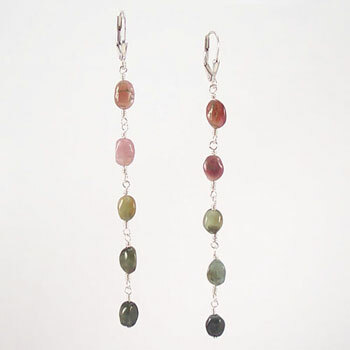 -I knew it was time to get some handmade gemstone jewelry designed. What I love about both these necklaces are they are so versatile. Either one could easily transition from your work outfit to a night out with friends. 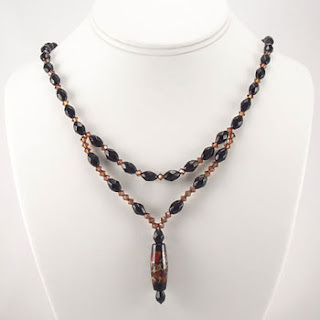 What I love most about this first necklace is you can wear it two different ways: (1) with the stylish clasp in the front like a pendant or; (2) put the clasp in back for a simple statement look. 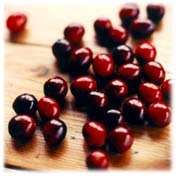 The next gemstone necklace was actually inspired by raisins and cranberries! Not really the food, but the colors of the food: a rich brown and deep ruby red. Now don't those cranberries and raisins looks yummy?! 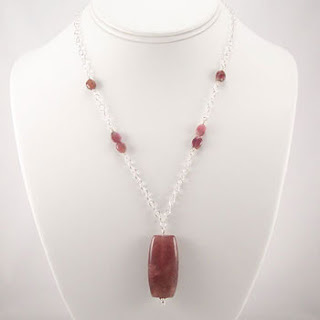 This necklace could easily be called "Cranberries and Raisins Gemstone Necklace". 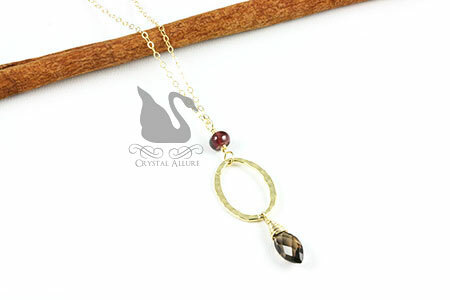 Handmade pendant necklace featuring a marquis-cut smokey quartz gemstone pendant accented with a lovely rhodolite garnet gemstone wire-wrapped between a hammered 14kt gold fill hoop all on a 17" 14kt gold fill cable chain. Pendant is a 2" drop. 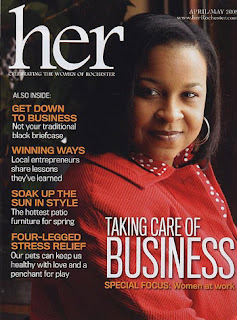 Celebrating the women of Rochester, New York, April/May 2008 HER Magazine for women. You can pick up your own copy at one of the convenient "pick up locations" listed on the site or sign up for their newsletter. 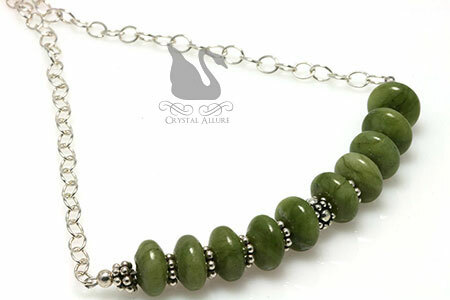 When I saw these stunning green nephrite jade rondelles they reminded me of what looked like 'peas in a pod'. Don't you agree? 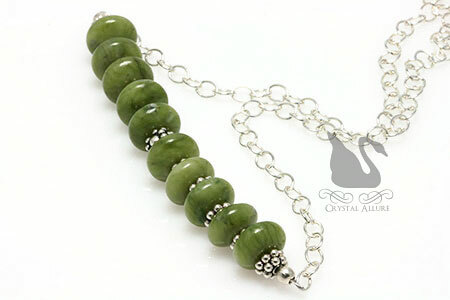 Just like peas in a pod, 10 beautiful creamy pea green nephrite jade gemstones are accented by .925 Bali beads and spacers, strung on a sterling silver cable chain. Length is PRINCESS at 17" (but adjusts to any length along the chain). 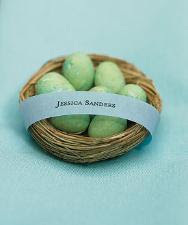 Or maybe they are just lucky gemstones perfect for a chic St. Patrick's Day dinner out! 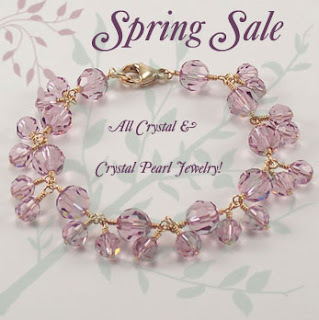 New Spring Jewelry Creations Are Arriving! Yeah! 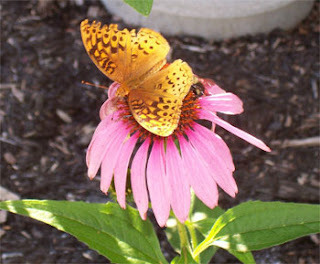 It's Spring -finally! Crystal Allure is doing some spring cleaning (stay tuned for exciting changes). But, I still managed to find some time to create some fresh new pieces for Spring (and more will be following). 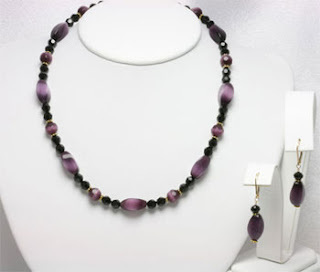 Both of the following gemstone jewelry necklaces have coordinating drop earrings to complete the look. 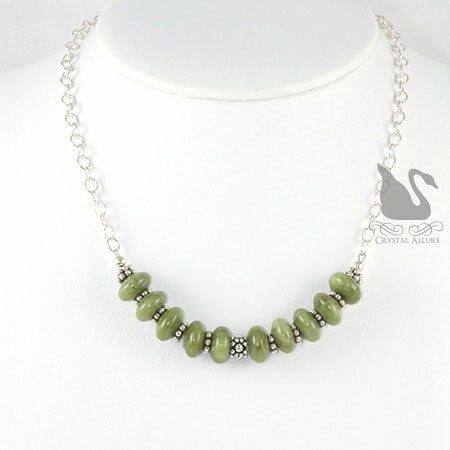 A simple and elegant jade gemstone teardrop is so soothing and forms the perfect centerpiece for this necklace. 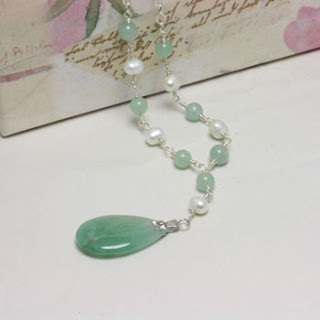 Hand-wrapped links of sterling silver, mint freshwater pearls and jade rounds lead up to sterling silver cable chain. 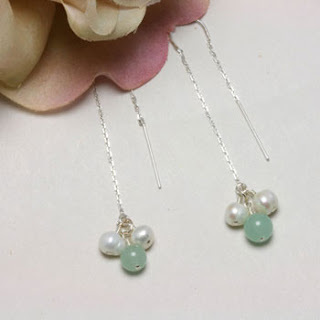 A single soothing jade gemstone is surrounded by pale mint green freshwater pearls and hand-wrapped for a beautifully feminine pair of handmade beaded earrings on sterling silver threader ear wires. 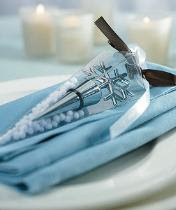 Length is 2-1/2". And what's springtime if we don't have any pink! 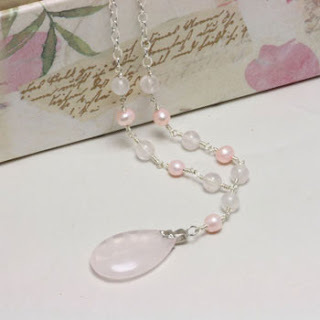 Delicate translucent pink rose quartz gemstones are surrounded by blush-pink colored freshwater pearls and hand-wrapped for a beautiful and feminine coordinating jewelry set. 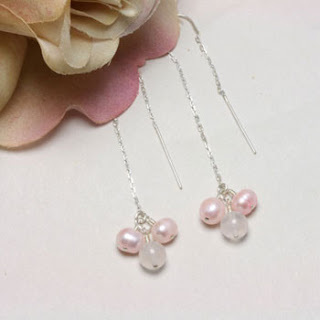 Handmade beaded earrings of pink pearls and gemstones are on sterling silver threader earwires and are 2-1/2" in length. 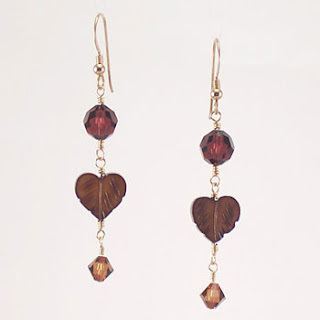 Check out the jewelry articles to read more about the gemstones used in these designs. My philosophy has always been: If you want something done, and done right, do it yourself. But as we all know, this can be quite a challenge especially if we are talking about business or if you don’t fully know how to do what you need done. 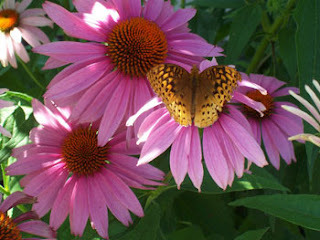 You are only one person, yet to wait on other people is just irritating beyond words. Especially if you ask for something to be done and then you sit and wait…and wait…and wait…. These are what some people might deem the ”little” things. But it is exactly these “little” things that create frustration and “clutter” in your life and just drive you batty because the reality is, if you had done it -it would be done. Period. You could move on and wouldn’t have to keep going back to figure out what was or was not done, wasting more of your time. Or worse, have to make up months of lost time because you believed someone else was actually doing the job. While I sit and wait for others to do what I have requested (and they are fully capable of and have the knowledge to do), my ability to progress and move forward is halted. There are a few things “cluttering” my life and business progression right now and I’m at the boiling point. I realize everyone has to watch out for themselves, but what makes service vendors think that I can just sit and wait for them to do what I’ve asked? I have a business to run and obviously I can’t count on them to get the job done -because if I could, well, it would be done and I wouldn’t be saying what I am right now. I expected this year to be the year of change and progression and that has not been the case. In fact, I feel like it’s year one of my business again…except now I’m waiting on other people. UGH. If you can’t do the scope of the job then don’t sign up for it. Period. Case in point: One of the things that has led to this post is the fact that I enlisted an accountant (who willing signed up) to get my parts and inventories up to speed for proper year end tax recording. I had been entering transactions all along but just didn’t prepare for my inventory and tax time. So, I scrambled to do a physical count of all my components (let me tell you..that alone would drive any jewelry designer up the wall!) but I did it. I send my data and financial file to this person back in, oh, late March or so. Although I had been checking the status of the file all along it finally got to the point in late July where I just told this person to email my file back to me and I’ll have to finish it. Problem 1: While this file was being worked on -I was still conducting business -what was I suppose to do? Stop my business until this person finished the file? So, not only do I need to catch up on still all the work this person said they’d get done -I now have four + months of new transacations and purchases to record. So…how am I better off for hiring a professional? Problem 2: I have no clue how to enter these things in the financial file -cause if I did…well, I wouldn’t have hired a professional to do it for me. Why? Because (let’s all say this together now): If you want something done, and done right, do it yourself.